Was it a burned-out rocket booster, tumbling along a peculiar near-earth orbit around the sun, and only occasionally getting close enough to be studied with even the largest telescopes? Not at all, as it turns out. While, based on previous observations, most astronomers had strongly suspected that object (469219) 2016 HO3 was an ordinary asteroid and not space junk, it took a team of astronomers led by Vishnu Reddy, assistant professor at the Lunar and Planetary Laboratory, University of Arizona, working with one of the world's largest telescopes, the Large Binocular Telescope (LBT), on Mt. Graham in Southeastern Arizona, to learn the true nature of this near-Earth object. 2016 HO3 is a small near-Earth object (NEO) measuring no more than 100 meters (330 feet) across that, while orbiting the Sun, also appears to circle around the Earth as a "quasi-satellite." 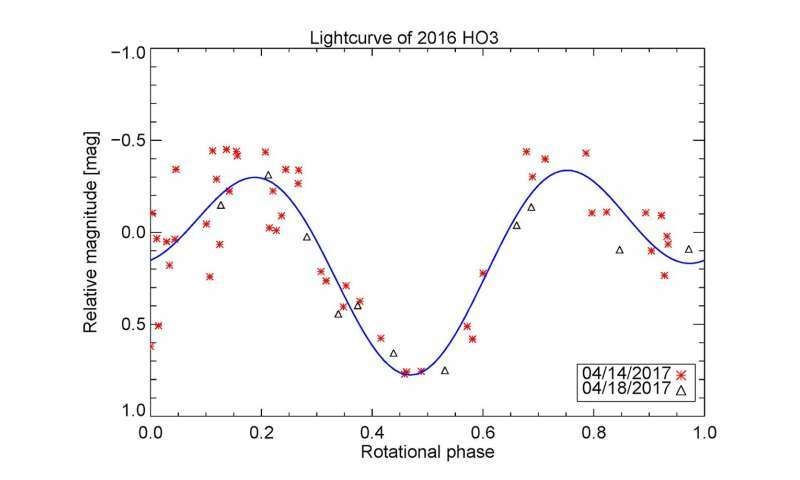 Only five quasi-satellites have been discovered so far, but 2016 HO3 is the most stable of them. The provenance of this object is unknown. On timescales of a few centuries, 2016 HO3 remains within 38-100 lunar distances from us. "While HO3 is close to the Earth, its small size – possibly not larger than 100 feet – makes it challenging target to study, said Reddy. "Our observations show that the HO3 rotates once every 28 minutes and is made of materials similar to asteroids." Soon after its discovery in 2016, astronomers were not sure where this object came from, but in a recent presentation at the annual Division for Planetary Sciences Conference of the American Astronomical Society in Provo, Utah, Reddy and his colleagues show that Earth's new traveling buddy is an asteroid and not space junk. The new observations confirm that 2016 HO3 is a natural object of similar provenance to other small NEOs that zip by the Earth each month. "In an effort to constrain its rotation period and surface composition, we observed 2016 HO3 on April 14 and 18 with the Large Binocular Telescope and the Discovery Channel Telescope," Reddy said. "The derived rotation period and the spectrum of emitted light are not uncommon amongst small NEOs, suggesting that 2016 HO3 is a natural object of similar provenance to other small NEOs." In their presentation, "Ground-based Characterization of Earth Quasi Satellite (469219) 2016 HO3," Reddy and his co-authors, Olga Kuhn, Audrey Thirouin, Al Conrad, Renu Malhotra, Juan Sanchez, and Christian Veillet, point out that the light reflected off the surface of 2016 HO3 is similar to meteorites we have on Earth. One way to visualize HO3's orbit is by picturing a hula hoop dancer – the sun in this analogy – twirling two hoops around the hips at the same time, ever so slightly out of sync. While it orbits the sun, the object makes yearly loops (link to www.youtube.com/watch?v=zMJc7gmychk ) around the Earth. As a result, the object appears to orbit the Earth, but it is not gravitationally bound to our planet. "Of the near-Earth objects we know of, these types of objects would be the easiest to reach, so they could potentially make suitable targets for exploration," said Veillet, director of the LBT Observatory. "With its binocular arrangement of two 8.4-meter mirrors, coupled with a very efficient pair of imagers and spectrographs like MODS, LBT is ideally suited to the characterization of these Earth's companions." More information: "Ground-based Characterization of Earth Quasi Satellite (469219) 2016 HO3," Vishnu Reddy, Olga Kuhn, Audrey Thirouin, Al Conrad, Renu Malhotra, Juan A. Sanchez, Christian Veillet. 49th Annual Division for Planetary Sciences Meeting - Tuesday, October 17th, 2017. 204.07.